Hooray to all Eden Cheese lovers. 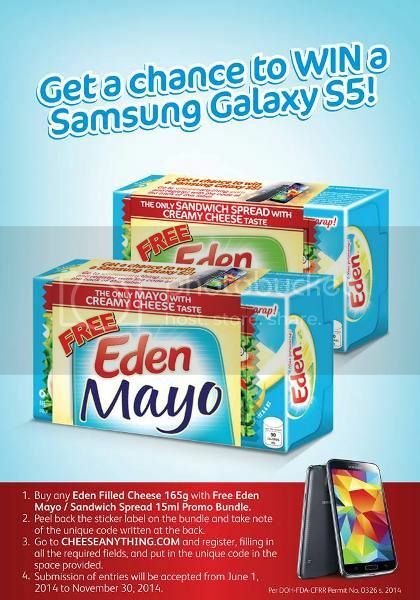 Enjoying you’re favorite merienda Eden Cheese spread get you a chance to win a Samsung Galaxy S5 smartphone! 1. Simply buy any EDEN FILLED CHEESE 165g with Free Eden Mayo/Sandwich Spread 15ml Promo Bundle. 2. Just peel back the sticker label on the bundle and take note of the unique code written at the back. 3. Then visit the website http://cheeseanything.com/register/ and fill in all the required fields including the unique code. 4. Submission of entries will be accepted from June 1 to November 30, 2014. 14 Responses for "Eden Cheese Promo Giveaway – Win a Samsung Galaxy S5 Smartphone"
How to registered to avail your promo? I love Eden cheese because it’s delicious and affordable for us mommies,,,,I just want to ask how can I register to your promo to avail an S5? I love eden cheese its delicious especially in spaghetti. Eden is my long time favorite for it complies the tastebuds of my family.